Ugali is a basic staple eaten across several African countries. It only differs in name and consistency (hard or soft). It is very simple to make, you will need a pot and flat wooden spoon. 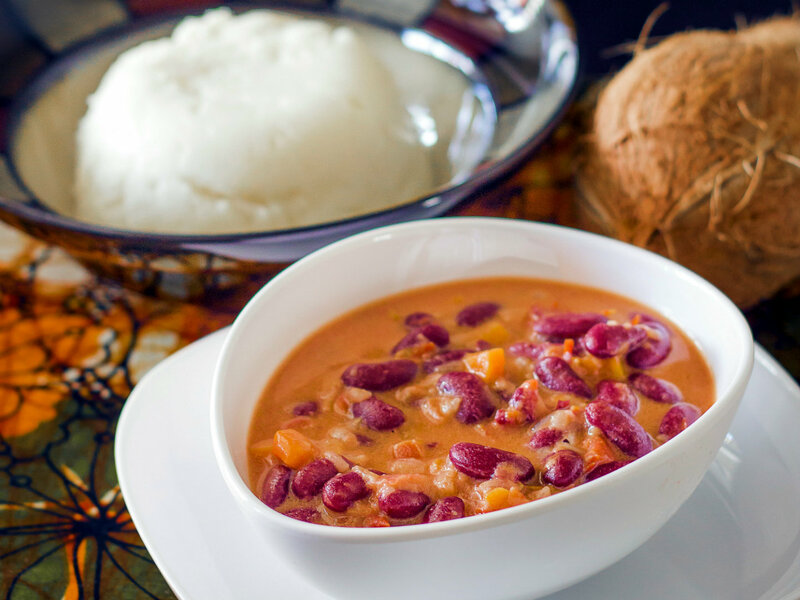 Cooking kidney beans in coconut is one of the tastiest ways to enjoy them. It is a very simple recipe that does not require anything special. In a pot, warm the water on high heat for about 3 minutes. Do not boil. Add half of the flour and stir it in with a wooden spoon. Continue to stir until it thickens and becomes porridge. It should be bubbling. Once you’ve reached this consistency, cover the pot and leave it to cook for 4 minutes on medium heat. Take the pot off the heat and add the rest of the flour. Stir it in with the wooden spoon (you can do this in portions). As you mix in the rest of the flour it will become harder, almost like play dough, continue to mould it until all the flour is mixed in, and mash all the lumps. After 4 minutes, open the pot and turn the mixture one the other side. Cover and put back on the heat. Repeat this step twice. In a pan, heat the oil over medium heat, add the onion and stir. When the onions begin to become light brown, add the tomatoes. Stir and mash them in. Once the tomatoes soften, add the carrots, stir and let them cook for 2 minutes, then add the beans and salt to taste, and stir. Add the coconut milk and stir. Reduce the heat to low and allow simmering for 3 minutes, stirring it occasionally to prevent the mixture from sticking to the bottom. I tried this recipe today, as my first attempt at Tanzanian cooking. It was delicious! We enjoyed the simple flavours and the coconut cream with the vegetables. This is interesting,I have also found out that the coastal people in Kenya love the same dish due to the proximity with their Tanzania counterparts.